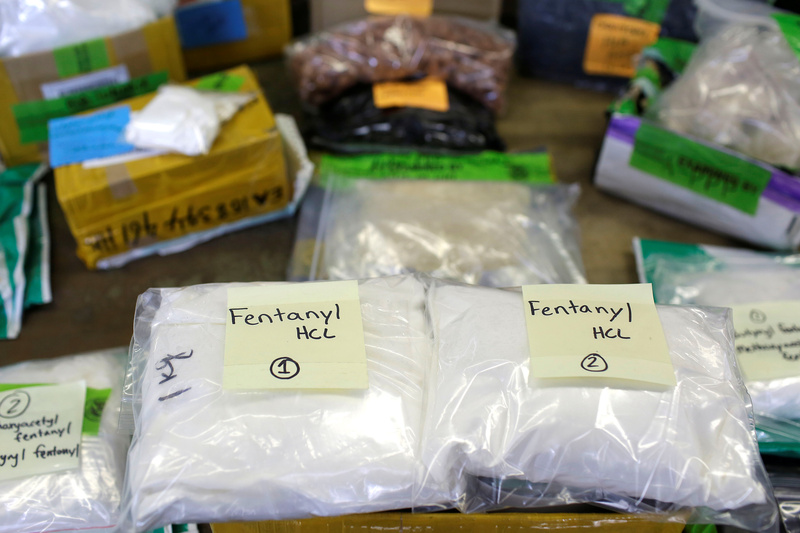 An inflow of lethal fentanyl from China helped America record nearly 72,000 fatal drug overdoses last year. A breakdown of trust over tariffs may make it harder to cooperate over this dangerous import, and fuel unhelpful arguments about whether supply or demand is to blame. Plastic bags of Fentanyl are displayed on a table at the U.S. Customs and Border Protection area at the International Mail Facility at O'Hare International Airport in Chicago, Illinois, U.S. November 29, 2017. U.S. President Donald Trump on Aug. 20 urged the Senate to pass a bill that would make it easier to crack down on the illegal postal supply of fentanyl, a powerful painkiller. The Synthetics Trafficking and Overdose Prevention Act, or STOP for short, would require the U.S. postal service to provide electronic data on all international packages to law-enforcement authorities. Another bill due to be considered by the Senate – the Stop the Importation and Trafficking of Synthetic Analogues Act – would enable the Justice Department to class new drugs as “controlled substances” if they resemble existing drugs. Drug overdose deaths in the United States topped 72,000 in 2017, according to the Centers for Disease Control and Prevention. Some 49,000 of these were opioid-related, and over 29,000 deaths were linked to synthetic opioids – those not derived from naturally occurring opium – such as fentanyl.